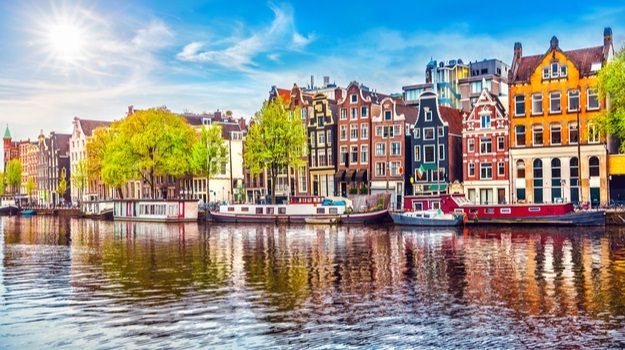 The European Medicines Agency (EMA) is relocating from London to Amsterdam. According to EMA, the Seat Agreement allows EMA to function independently in the Netherlands. Similar agreements apply to other EU agencies located in the Netherlands. On Friday, 13 April 2018, the Dutch Council of Ministers agreed to sign the document. Quantify research reported earlier this year that the shift of the EMA to Holland will be a welcome boon to that country, particularly due to some companies shuttering their Netherlands locations in favor of other European countries. The research report pointed to more than 1,500 job losses about eight years ago following Abbott and Merck Sharpe and Dohme closing facilities in that country. Between 2009 and 2014, Quantify said the Dutch market share in the European pharma industry plummeted from 3.3 percent in 2009 to 17 percent in 2014. But, it’s not just the large global pharma companies that have a home in Holland. The country is also home to a number of biopharmaceutical startups and scale-ups, like Galapagos, Genmab, Pharming and uniQure. Another company that will be relocating to the Netherlands is Gilead Sciences. This new facility will be employing over 300 people. Other companies worth mentioning are GSK-Novartis, Merk and most well-known Clinical Research Organizations (CROs) have made the Netherlands their home. For those interesting in working and living in Amsterdam, you should know that it is one of the countries with the highest taxes at a 52% income tax rate if you make over 55,000 euros per year (apparently they think this is good money). For a regular employee with benefits, your tax rate will be at a 42 %. Don’t expect to be making more than 55,000 euros a year unless you are a highly skilled employee or hold a managerial level position. Fair Use Notice: Images/logos/graphics on this page contains some copyrighted material whose use has not been authorized by the copyright owners. We believe that this not-for-profit, educational, and/or criticism or commentary use on the Web constitutes a fair use of the copyrighted material (as provided for in section 107 of the US Copyright Law). The National Cancer Institute issued the Common Terminology Criteria for Adverse Events (CTCAE) version 5.0 on November 27, 2017. So what is CTCAE and what is it used for? The terminology NCI CTCAE is a descriptive terminology that can be used for the declaration of adverse events (AEs). A grade scale (or severity) is provided for each term. The oncology community has a standard classification and severity grading scale for adverse events in cancer therapy clinical trials and this is what it is described in the CTCAE reference. MedDRA dictionary. It is identified by a physiological or anatomical classification, etiological or a result (ex: SOC investigations for laboratory results). The terms of the CTCAE are grouped together according to the MedDRA primary SOCs. Within each SOC, the terms are listed and accompanied a description of the severity (grade). MedDRA LLT level term (Low Level Term, lowest level of the hierarchy). Grade 5: Death related to AE and it is not appropriate for some AEs and therefore is not an option. intervention indicated< Death A disorder characterized by cessation of the pumping function of the heart. CTCAE is still the formal reporting for AEs and grading dependent upon clinician judgement of medical significance. A copy is located here: CTCAE version 5.0. 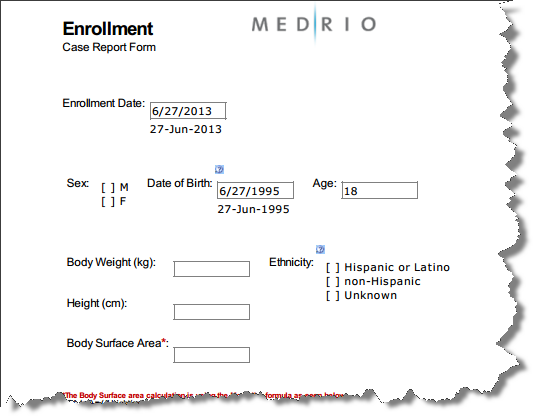 Medrio is a low cost solution that offers easy mid-study changes and intuitive phase I workflows. One of my favorite features of Medrio is the Skip logic functionality. So what is Skip logic? In many EDC systems that I am currently using or used in the past, we have to create separate fields for each option and write a custom edit check to flag when data has been entered under the specify field. This scenario request data on the specify field if the OTHER race option is checked but with skip logic, no other option will be allowed to enter data (e.g. 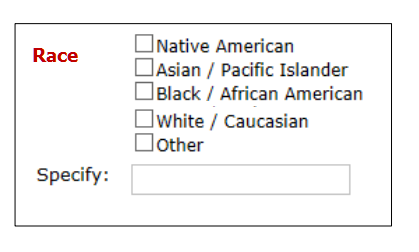 White or Black or Indian) if the user did not select OTHER as an option and the required field ‘Specify’ is made visible and available (mandatory) for data entry. In the above screenshot, the query resulting from the skip logic configuration if OTHER specify is not completed. In other words, when Race other than ‘OTHER’ is checked, the specify field will be skipped (not enterable). To make this work and as a best practice, you will need to make the ‘OTHER’ field required during data entry. If you are looking for a study builder or clinical programmer to support your clinical trials and data management department, please use the contact form. Disclaimer: The EDC Developer blog is “one man’s opinion”. Anything that is said on the report is either opinion, criticism, information or commentary, If making any type of investment or legal decision it would be wise to contact or consult a professional before making that decision. 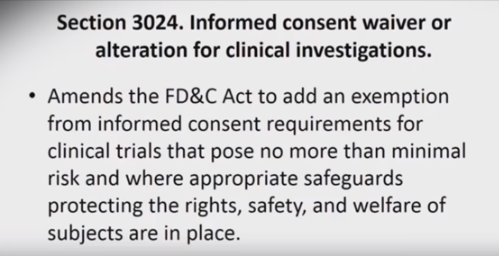 The 21st Century Cure Act would demand that the Food and Drug Administration (FDA) add an exemption from informed Consent requirements for those clinical trials that pose no more than minimal risks and the appropriate safeguards protecting the right, safety and welfare of subjects. The above can be found in section 3024 – Informed Consent Waiver or Alterations for Clinical Investigations. So what they are saying now they don’t have to obtain informed consents to test vaccinations or drugs on humans beings if it has been determined that the proposed pose no more than minimal risks. (g)(1) The purpose of this section to encourage to the extent consistent with the protection of public health and safety and ethical standards, the discovery and development of useful devices intended for human use and to that end to maintain optimum freedom for scientific investigators in their pursuit of that purpose. In other words, you can get an exemption for certain conditions. Question: if you don’t have informed consent in clinical trials experimentation on people, then how does anyone knows you are not part of an experiment? If sponsors and clinical researchers not longer has to tell you that you are part of it or get your consent to informed you what they are doing? That may sound a little crazy. Computerized systems are used throughout the life sciences industry to support various regulated activities, which in turn generate many types of electronic records. These electronic records must be maintained according to regulatory requirements contained within FDA’s 21 CFR Part 11 for US jurisdictions and Eudralex Volume 4 Annex 11 for EU jurisdictions. Therefore, we must ensure the GxP system which maintains the electronic record(s) is capable of meeting these regulatory requirements. What to look for in Audit Trail? Is the audit trail activated? SOP? of audit trail data? Training of staff? Can you prove data manipulation did not occur? Persons must still comply with all applicable predicate rule requirements related to documentation of, for example, date (e.g. 58.130(e)), time, or sequencing of events, as well as any requirements for ensuring that changes to records do not obscure previous entries. Consideration should be given, based on a risk assessment, to building into the system the creation of a record of all GMP-relevant changes and deletions (a system generated “audit trail”). Identification of the User making the entry This is needed to ensure traceability. This could be a user’s unique ID, however there should be a way of correlating this ID to the person. Date and Time Stamp This is a critical element in documenting a sequence of events and vital to establishing an electronic record’s trustworthiness and reliability. It can also be effective deterrent to records falsification. Link to Record This is needed to ensure traceability. This could be the record’s unique ID. Limited access to audit trail files (many systems with different reporting tools or extraction tool. Data is not fully integrated. Too many files and cannot be easily integrated). No audit trail review process. Be prepared to update SOPs or current working practices to add review time of audit trails. It is expected that at least, every 90 days, qualified staff performed a review of the audit trail for their trials. Proper documentation, filing and signature should be in place. Avoid using Excel or CSV files. Auditors are now asking for SAS datasets of the audit trails. Auditors are getting trained to generate their own output based on pre-defined set of parameters to allow auditors to summarize data and produce graphs. Formatting issues when exporting into Excel, for example. Numbers and dates fields change it to text fields. What data must be “audit trailed”? When it comes to determining on which data the audit trail must be applied, the regulatory agencies (i.e. FDA and EMA) recommend following a risk based approach. With respect to predicate rule requirements, the agency states, “Persons must still comply with all applicable predicate rule requirements related to documentation of, for example, date (e.g., § 58.130(e)), time, or sequencing of events, as well as any requirements for ensuring that changes to records do not obscure previous entries.” In the docket concerning the 21 CFR Part 11 Final Rule, the FDA states, “in general, the kinds of operator actions that need to be covered by an audit trail are those important enough to memorialize in the electronic record itself.” These are actions which would typically be recorded in corresponding paper records according to existing recordkeeping requirements. When does the Audit Trail begin? The question of when to begin capturing audit trail information comes up quite often, as audit trail initiation requirements differ for data and document records. If the data is recorded directly to electronic storage by a person, the audit trail begins the instant the data hits the durable media. It should be noted, that the audit trail does not need to capture every keystroke that is made before the data is committed to permanent storage. This can be illustrated in the following example involving a system that manages information related to the manufacturing of active pharmaceutical ingredients. If during the process, an operator makes an error while typing the lot number of an ingredient, the audit trail does not need record every time the operator may have pressed the backspace key or the subsequent keystrokes to correct the typing error prior to pressing the ‘‘return key’’ (where pressing the return key would cause the information to be saved to a disk file). However, any subsequent ‘‘saved’’ corrections made after the data is committed to permanent storage, must be part of the audit trail. If the document is subject to review and approval, the audit trail begins upon approval and issuing the document. A document record undergoing routine modifications, must be version controlled and be managed via a controlled change process. However, the interim changes which are performed in a controlled manner, i.e. during drafting or review comments collection do not need to be audit trailed. Once the new version of a document record is issued, it will supersede all previous versions. 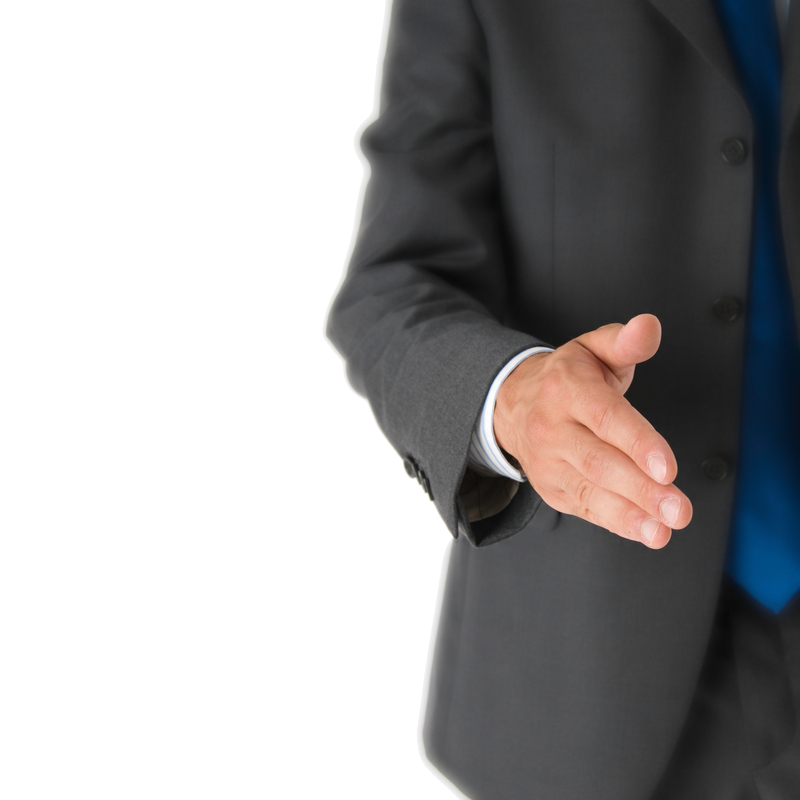 Questions from Auditors: Got Answers? When was data locked? Can you find this information easily on your audit trail files? When was the database/system released for the trial? Again, how easily can you run a query and find this information? When did data entry by investigator (site personnel) commence? When was access given to site staff? Regulatory agencies around the globe are causing life science companies to be increasingly concerned with data integrity. This comes with no surprise given that Guidance Documents for Data Integrity have been published by the MHRA, FDA (draft), and WHO (draft). In fact, the recent rise in awareness of the topic has been so tremendous that, less than two years after the original publication, the MHRA released a new draft of its guidance whose scope has been broadened from GMP to all GxP data. Is data integrity an issue of good documentation practices? You can read GCP information about this topic here. In computerised systems, failures in data integrity management can arise from poor or complete lack of system controls. Human error or lack of awareness may also cause data integrity issues. Deficiencies in data integrity management are crucial because they may lead to issues with product quality and/or patient safety and, ultimately may manifest themselves through patient injury or even death. I recently was at the vendor qualification tool that uses a hand held device to read data while the physician or expert manually put pressure on someone’s body parts (e..g. pain related). I was not impressed. Even though it seems like a nice device with its own software, the entire process was manual and therefore, questionable data integrity. The measurement seems to be all over the place and you would need the right personnel at the clinical site to perform a more accurate reading since again, it was all manual and dependent of someone else used of the device. I also questioned the calibration of this device. The sale’s person answer ? “Well, it is reading 0 and therefore, it is calibrated.”….Really? You mean to tell me you have no way of proving when you perform calibration? Where is the paper trail proving your device is accurate? You mean to tell me I have to truth your words? Or your device’s screen that reads ‘0’? Well, I have news for you. Tell that to the regulators when they audit the trial. Data can be defined as any original and true copy of paper or electronic records. In the broadest sense, data integrity refers to the extent to which data are complete, consistent and accurate. To have integrity and to meet regulatory expectations, data must at least meet the ALCOA criteria. Data that is ALCOA-plus is even better. What is a Computerised System? A computerised system is not only the set of hardware and software, but also includes the people and documentation (including user guides and operating procedures) that are used to accomplish a set of specific functions. It is a regulatory expectation that computer hardware and software are qualified, while the complete computerised system is validated to demonstrate that it is fit for its intended use. How can you demonstrate Electronic Data Integrity through Validation? Here are some techniques to assist you in ensuring the reliability of GxP data generated and maintained in computerised systems. Outline your expectations for data integrity within a requirements specification. Define requirements for the data review processes. 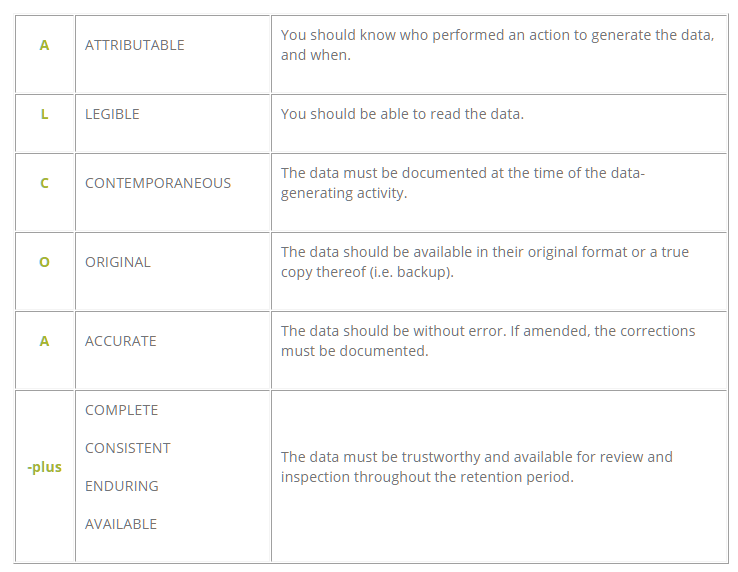 Define requirements for data retention (retention period and data format). Validation is meant to demonstrate a system’s fitness for intended use. If you define requirements for data integrity, you will be more inclined to verify that both system and procedural controls for data integrity are in place. Verify that the system has adequate technical controls to prevent unauthorised changes to the configuration settings. Define the system configuration parameter within a configuration specification. Verify that the system configuration is “locked” to end-users. Only authorized administrators should have access to the areas of the system where configuration changes can be made. The inspection agencies expect you to be able to reconstruct any of the activities resulting in the generation of a given raw data set. A static system configuration is key to being able to do this. Confirm that procedures are in place to oversee the creation of user accounts. Confirm that user accounts are uniquely tied to specific individuals. Confirm that generic system administrator accounts have been disabled. Confirm that user accounts can be disabled. Shared logins or generic user accounts should not be used since these would render data non-attributable to individuals. System administrator privileges (allowing activities such as data deletion or system configuration changes) should be assigned to unique named accounts. Individuals with administrator access should log in under his named account that allows audit trails to be attributed to that specific individual. Confirm that procedures are in place to oversee user access management. Verify that a security matrix is maintained, listing the individuals authorized to access the system and with what privileges. A security matrix is a visual tool for reviewing and evaluating whether appropriate permissions are assigned to an individual. The risk of tampering with data is reduced if users are restricted to areas of the system that solely allow them to perform their job functions. Confirm that procedures are in place to oversee training. Ensure that only qualified users are granted access to the system. People make up the part of the system that is most prone to error (intentional or not). Untrained or unqualified users may use the system incorrectly, leading to the generation of inaccurate data or even rendering the system inoperable. Procedures can be implemented to instruct people on the correct usage of the system. If followed, procedures can minimize data integrity issues caused by human error. Individuals should also be sensitized to the consequences and potential harm that could arise from data integrity issues resulting from system misuse. Logical security procedures may outline controls (such as password policies) and codes of conduct (such as prohibition of password sharing) that contribute to maintaining data integrity. Verify calculations performed on GxP data. Devise a test scenario where input data is manipulated and double-check that the calculated output is exact. When calculations are part of the system’s intended use, they must be verified to ensure that they produce accurate results. Verify the system is capable of generating audit trails for GxP records. Devise a test scenario where data is created, modified, and deleted. Verify each action is captured in a computer-generated audit trail. Verify the system time zone settings and synchronisation. With the intent of minimizing the falsification of data, GxP record-keeping practices prevent data from being lost or obscured. Audit trails capture who, when and why a record was created, modified or deleted. The record’s chronology allows for reconstruction of the course of events related to the record. The content of the audit trails ensures that data is always attributable and contemporaneous. For data and the corresponding audit trails to be contemporaneous, system time settings must be accurate. prevent unauthorized access or changes to data. Is QA oversight lacking? Symptom of weak QMS? Even though we try to comply with regulations (regulatory expectations from different agencies e.g. 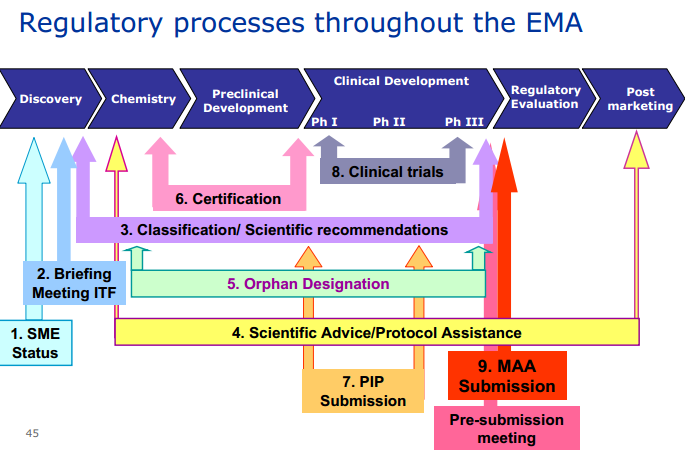 EMA, MHRA, FDA, etc), data integrity is not always easy to detect. It is important the staff working in a regulated environment be properly trained and continuous refresher provided through their career (awareness training of new regulations and updates to regulations). Companies should also integrate a self-audit program and develop a strong quality culture by implementing lesson learned from audits. The International Conference on Harmonization (ICH) is involved in promoting public health, improve efficiency of new drug development and registration process among other objectives. 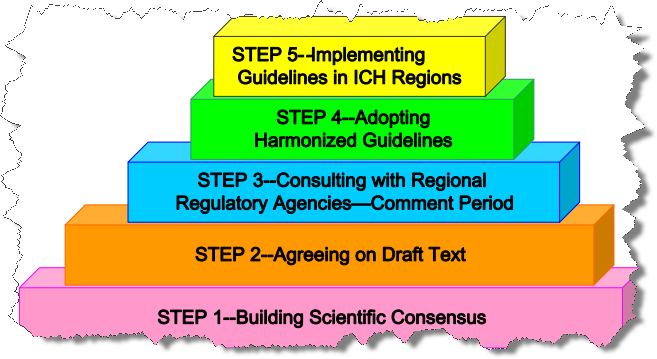 In order to accomplish this, ICH has developed and implemented harmonized guidelines and standards, also known as ICH6. The European Medicines Agency (EMA) is a decentralised body of the EU. EMA is responsible for centralised procedure and co-ordination of EU network + plays a role in stimulating innovation and research in the pharmaceutical sector. Conclusion: ICH-GCP guidelines brought forth public awareness that there was a need to control and regulate clinical trials dealing with drugs and human subjects. ICH main goal is to provide a unified standard for the European Union (EU), Japan and the United States to facilitate the mutual acceptance of clinical data by the regulatory authorities in these jurisdictions. their origin in the Declaration of Helsinki, and that the clinical trial data are credible. Below is the link to the most common terms used in clinical trials (for reference). Use it as your leisure, during work hours and day-to-day work as a clinical researcher. All Adverse Events and Previous/Concomitant Medication should be coded and/or approved prior and during the trial. Before adverse event terms can be reported or analyzed, they must be grouped based on their similarities. For example, headache, mild headache and acute head should all be counted as the same kind of event. This is done by matching (or coding) the reported adverse events against a large codelist of adverse events which is also known as dictionary or thesaurus. Test cases and other documentation associated with the testing of auto-coding should be produced/documented. This documentation is not part of the plan. It is a product of the design process and should be filed separately in the TMF system. In the DMP. you should document the variables and the dictionary to be used. For Concomitant Medications, WHO drug reference list is used. Also document the version used and if applicable, the final version of the who drug (for trials running over 6 months). For Adverse event, MedDRA dictionary is the choice of coding method. Document the version used. For electronic-automatic reconciliation between systems, there are some challenges you need to identify first such as which type of data is to be reconciled and then which fields to compare. Best practice is to reconciled those considered serious according to regulatory definitions. For manual reconciliation, reports such as SAS listings extracted from both systems with study information, subject or investigator and other key data can be used to perform manual review. A manual comparison of the events can then assure that they are both complete and comparable. No matter which method you used for reconciliation, each type of data (eg, AE, MedHist, Conmed) should document which glossaries and version were used. identical. The processes and frequency of reconciliation should be specified. Anayansi Gamboa has an extensive background in clinical data management as well as experience with different EDC systems including Oracle InForm, InForm Architect, Central Designer, CIS, Clintrial, Medidata Rave, Central Coding, Medrio, IBM eCOS, OpenClinica Open Source and Oracle Clinical.